Your Dinoz and the other monsters take turns attacking each other. The attacks are a combination of their initiative, speed, and energy. 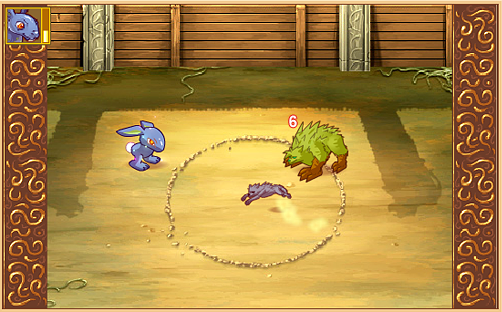 With each successful attack, your opponent will lose health points (as shown in the image above). Your Dinoz must kill all monsters in order to win the fight. Fire, Wood, Water, Lightning, Air. An element is strong against the two following it and weak against the two preceding it. So, for example, Fire is very strong against Wood and strong against Water, but is very weak against Air and weak against Lightning. Assaults are always formulated in a precise order which is determined by the combinations of the elemental values - in case of equality, the draw is randomised. Once the five assaults have been completed, your Dinoz will start again with a Lightning assault. The higher the assault strength of an element, the more damage a Dinoz will inflict upon his opponents when he makes an elemental attack. The higher the Dinoz's defense against an element, the Dinoz will be better protected against the opponents' attacks by this element. Many monsters use void elemental assaults. This means that all your Dinoz's elemental characteristics are taken into consideration for the defense. However, some monsters use assaults or special attacks of a particular element. At the end of each fight, your Dinoz will earn coins which allow your Dinoz to heal himself and also earn experience points which you can use to make your Dinoz 'Level Up'. This dinoz is asleep. It cannot move. This dinoz cannot be hit by a conventional assault. This dinoz has been slowed down. This dinoz is petrified, so cannot attack. This dinoz has an assault bonus. This dinoz is poisoned and takes damage on every turn. This dinoz currently cannot use all its items. This dinoz is dazzled, it may miss when trying to attack another dinoz. This dinoz is protected by another member of its team. This dinoz has been muted and therefore cannot summon its invocation. This dinoz can copy skills from its adversaries. This dinoz cannot use itms from its inventory. This dinoz has an energy penalty. This dinoz has an energy bonus. This dinoz has a fire defence bonus. This dinoz has a wood defence bonus. This dinoz has a water defence bonus. This dinoz has an air defence bonus. This dinoz has an initiative bonus. This dinoz has an initiative penalty. This dinoz has a dodge bonus. This dinoz has a defence bonus.